Gallant behaviour of an English Sailor in offering a sword to an unarmed Spaniard to defend himself, at the taking of Fort Omoa, in the Bay of Honduras, October 20th 1779, engraved by John Record after Metz, c.1785, Library of Congress. Here is another edition of the British tar at Omoa. 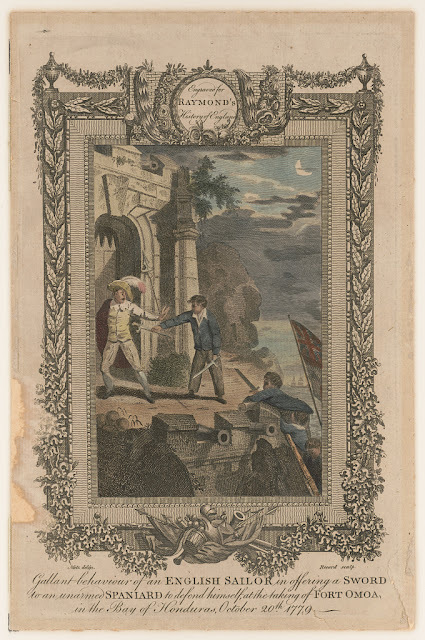 This print was engraved for Raymond's History of England, a work that (according to the Brighton Royal Pavilion and Museums) was first published in 1754, but continued into 1787. The Library of Congress dates this c. 1785, as the particular edition that this was published in included events through the Spring of 1784. Other copies exist in the collection of the National Maritime Museum and British Museum. Though intended as a historical piece, rather than as a caricature or political cartoon, this engraving portrays the Spaniard in archaic clothing more reminiscent of the seventeenth century than the late eighteenth. Portrayals of Spaniards as backward or out of sync with the times were incredibly common among English cartoonists. It is interesting to note that a straight historical narrative of the time also depicted the stereotypical Spaniard in his anachronistic garb. The sailor wears no hat, and wears his hair short and loose. Without a neckcloth, his white shirt hangs open. The blue jacket is single breasted without pockets or collar, ending right below the natural waist. His plain trousers end just above the ankle, revealing rounded toe shoes. Three of his mates mount a ladder over the fortress walls. They too are hatless and wear blue jackets. It appears that the engraver or the colorist has given the second tar climbing the ladder a handkerchief around the neck, or perhaps a collar of different color than the body of the jacket.